Essential oils are basically the pure extract of these ingredients. It is proved that these oils have done so many great things in aromatherapy. While I have always wondered why spas have a peculiar smell and how it is so relaxing and soothing. The answer to that is these essential oils. Lavender essential oil, is the one I have been using for sometime since I was pregnant. Adding two drops to my bath water helped me sooth the nausea. 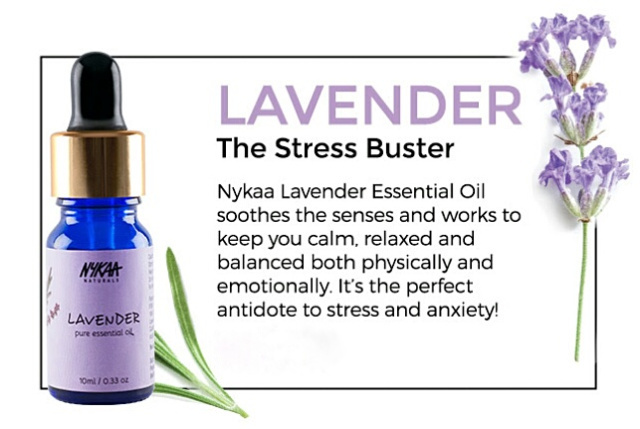 Lavender Essential Oil is kind of all-rounder. It solves all your skin, hair and sleep problems. When not sure of which oil to buy, you can safely choose Lavender. The smell is strong, one or two drops is more than enough to solve all your problems. Package: Bottle with a glass filler. 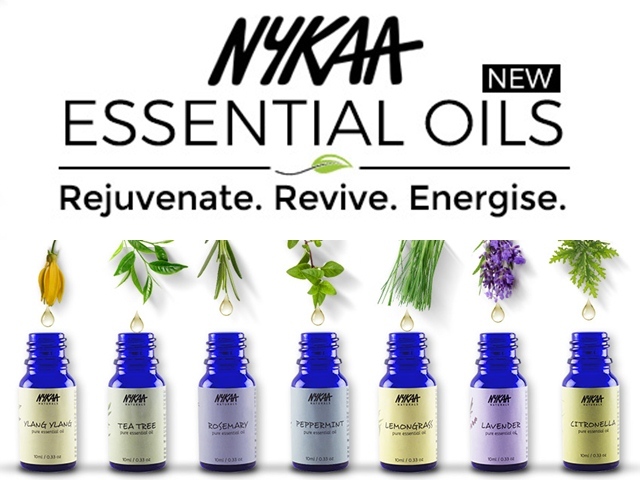 Available : Nykaa Stores , Also available in various combos. Just apply few drops to your pillow before sleeping, it reduces stress and gives a nice tight sleep. TESTED . Mix it with any carrier oil ( coconut / jocoba / almond ) and apply on face for glow and removing blemishes. Add a drop or two in your bath bucket/tub or enjoy a stress free relaxing bath. Bee Sting/ insect bite / minor cuts / minor burns it is quite useful. Mix it with carrier oil and apply on scalp for treating Dandruff. Chapped lips / chapped skin and enzema curing. Mix it water an spray it in curtains. Bring back your potpourris to life. Why does everyone needs Essential oils ? Having a bottle of one or two essential oil is quite necessary in every household. Most of these oils either has a soothing effect or uplifting effect which I personally believe is a must. Since these oils are pure extract, they are priced high and also one or two drops is more than enough for your purpose. Apart from Lavender, the one we recommend is Tea Tree oil. It is really great for those who are having acne and oily skin. Also treats dandruff well. It is kind of astringent type, still you can choose the Tea tree face wash from Body Shop. If you are looking for a woody fragrance then Rosemary will be fine. Rosemary also stimulates hair growth and can be added to your hair oil for healthy glowing hair. Lemongrass will give you a wakeup punch and activate your body and soul.I love mixing it in 3/4 parts of water and 1/4 vinegar and using it as a cleaning spray, perfect disinfectant and smells lovely and fresh. Also you can diffuse Peppermint essential oil with few drops of lemon grass/ Orange to increase your productivity. It kind of clears your nostrils. Follow us in Instagram, we share reviews everyday. Our stories are irresitable.